I’ve got to find my inner Energizer bunny soon. 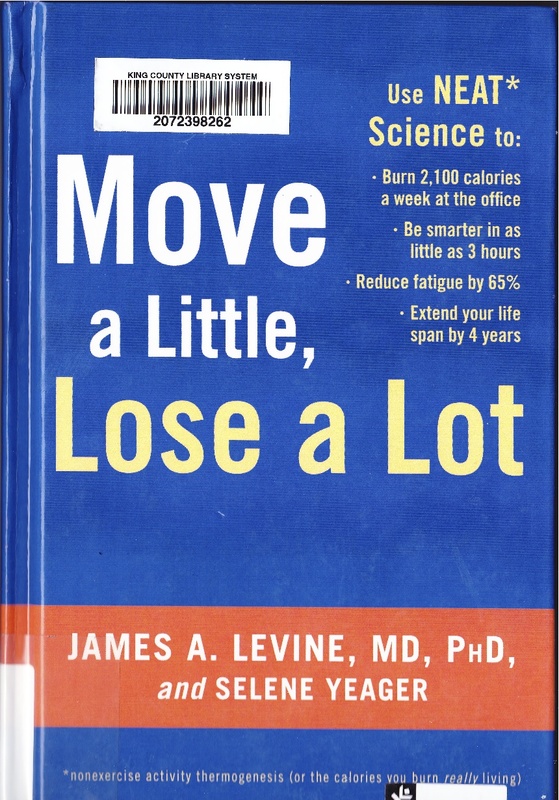 That’s because over the weekend I read “Move a Little, Lose a Lot,” a book by James A. Levine, M.D. which says, in so many words, “Sitting is the new smoking.” I wrote about this topic in my last blog based on a magazine article that quoted Levine. It interested me enough to track down the original source. In his book, Levine points out all the features of modern workplaces and homes that cause us to live more sedentary lives. He also makes recommendations for ways to add more movement to our days. I sat during most of the last three weeks. Sitting paid off in one respect. I completed the first draft of my novel and sent 349 pages to the woman who will help me with the second draft (by pointing out the flaws in the first one, but thankfully not doing this all at once). Levine’s work focuses on “the calories you burn while living your life,” as opposed to those you burn in a physical workout. He says if you exercise for the sake of fitness and you follow this up with long periods of sitting, you’ve not helped your health, because when you sit your system shuts down. Your body becomes like a bear’s in the winter. The obvious culprits that keep us from burning calories while going about the business of living include cars, computers, televisions and video games. But these aren’t all. Jobs that keep us seated for long periods, eating at our desks, electric alarm clocks, remote controls, polyester and other non-iron fabrics, electric toothbrushes, espresso machines, key finders, home grocery delivery and electric screw drivers also keep us from burning calories by limiting our movements. We burn fewer calories daily than did our ancestors even fifty years ago and they burned fewer than their forebears. What can we do to carry out Levine’s maxim of “better to live on your feet than die on your seat”? I don’t know anyone who wants to go back to ironing sheets like women did in our grandmother’s day or give up their computers. Still, there are things we can do. Standing up often is one of these. We burn three times as many calories getting up from a seated position than we do while we’re in the chair. Chewing gum burns a few more calories than standing up. Other small calorie burners include sweeping the floor, folding laundry, walking the dog, watering the garden and pulling weeds. Levine says walking is the number one way to overcome the negative effects of sitting, walking as a normal routine in your daily life. A good way to begin is to cover a mile here, a mile there, around your yard, to the store, to a bus stop. Walk while you’re on the phone, leave your cubicle to talk to a colleague at work or walk across the street to talk to a neighbor. His research shows that small changes eventually lead to big results. To avoid sitting disease, I’ve started walking away from my computer more often, weeding and moving around the house more. Today I’m testing out a new routine: spend twenty minutes cleaning and organizing drawers, bookcases, closets, shelves. The possibilities for getting exercise in a clutter house are endless.